Hey, guys and gals, I’m back with another build! As I’ve said a lot lately I’m trying to build out my Instagram following and my Facebook group, so I’d really appreciate if any reading this could check me out on those networks! Thanks! Do you have this problem: no proper place to put your sunglasses and jewelry in your bedroom? It’s basically the epitome of a first world problem. None the less I was tired of looking at my bedroom dresser with sunglasses, watches and various other pieces of jewelry strewn across the top of it. I decided to build this jewelry stand as a way to reduce the clutter and organize my room. You know the format, let’s do a quick tour of the finished project and then I’ll walk you through exactly how I made it! I suspect if I was single and lonely this is a problem I wouldn’t have. Here I am though, with a romantic partner and all the paraphernalia that comes along with that (mostly jewelry and elastic hairbands). I got the inspiration for this project while I was at the lumber mill recently. 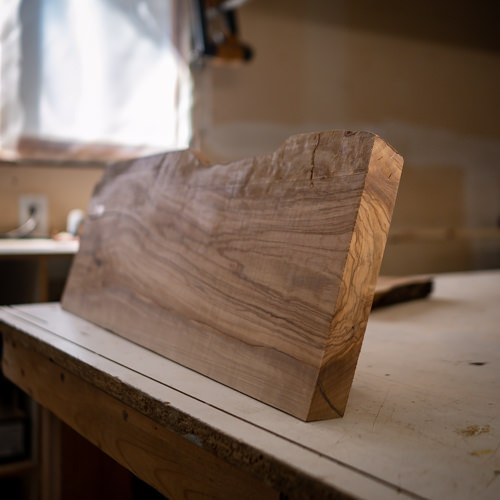 I was picking up the walnut I used in my bedframe project when I spied some smaller pieces of live edge olive wood. I didn’t know what I was going to use it for when I bought one, but I figured it out pretty quick. I was going to organize that pile of jewellery and sunglasses on top of my dresser damn it! Best of all, it only cost me 20 bucks! Here it is completely decluttered without anything on it, completely bare. This was a fun project that I did in an afternoon. It was a nice reprieve from the multi-day projects I’ve been doing lately. It feels good to walk into the shop with a bunch of materials and emerge a later in the day with a complete project haha. The left side of the rack has 3 taut bungee cords that I like to use to hold sunglasses. The lowest bungee cord, however, is kind of useless. I realized this pretty early on, but, I decided to keep it for symmetry’s sake. I also thought there was an off chance that I could find something to fit down there, as you can see from the photos that did not pan out. As it turns out the middle bungee also makes a great watch holder, so that’s nice. The right side of the rack has these cool gold “T” shaped drawer pulls that you can hang jewelry on. Mostly chains here, but a couple of earrings too. All belonging to my girlfriend. I really don’t have any jewelry outside of a single watch that I’m always wearing. So this is what I started with: A 1″ thick live edge slab of olive wood, some cheap bungee cords, and a couple of old knobs that I had left around in the shop. Keen-eyed observers will realize that I replaced these silver knobs with the golden “t” shaped drawer pulls. I didn’t care much for the knobs from the get-go and I needed some pulls around the house for other projects so I bulk ordered like 20 of the golden T pulls from Amazon for a little over $1 each. To start I had to decide how big I wanted the sunglass stand to be. I thought 24″ would be plenty of space, but after loading up the finished project with all of our jewelry and sunglasses I wish I made it bigger. Perhaps the smaller stand will force my girlfriend and I to pare down on needless materialistic trinkets (haha, ya right). Using a straight edge I pencilled on two parallel lines that were 24″ apart. Because I was working with a live edge piece of lumber I had no square edges to work off. My first line I placed more or less arbitrarily and then I measured my second line off of that first line. Using my chop saw (I know the correct name is mitre saw, but I like antagonizing woodworking purists) I cut along those lines I just pencilled on. Because I was working with a live edge piece of lumber and had no straight edges (yet) I put it against the back fence of the mitre saw and adjusted the angle of the base until the angle of the blade matched the angle of the lines I had sketched onto the surface of the wood. Once I had my piece of olive wood cut to 24″ inches I used a sharp (ish) chisel to debark it. Really wish I had a draw knife here, but, the chisel got the job done so I can’t complain. This got me about 90% of the way to de-barked. This must have been pretty fresh olive wood because it still had green moss in the bark. To get the last 10% of the bark off I improperly used my random orbital sander. I threw an 80 grit sanding pad on it and got to work. I also used it to round off some of the hard edges. This probably isn’t the best for the sander, but this particular sander is on its last legs anyway so I’m not too worried about it. While we’re on the subject of using power tools improperly….. I wanted to cut a 15-degree angle onto the base of my stand. So I traced a line along the bottom edge of the piece of wood, set my table saw to 15 degrees and then free hand pushed it through the table saw. I wouldn’t advise anyone to do this at home, especially if you aren’t comfortable using a table saw. Most “wood workers” will probably lose their minds looking at this picture. Anyone who works in the trades probably wouldn’t even think twice about it. It’s a very common practice among trim carpenters and guys who install hardwood floors. A much safer way to do this would’ve been to use some toggle clamps to attach it to a sled, put that against the fence and then push it through the table saw. Do as I say, not as I do! Now I have something close to the finished photos. Here you can see how the 15-degree angle on the bottom edge slants the whole stand back and helps present its contents to whoever is looking at it. Unfortunately for me, my sunglass stand won’t defy the laws of physics and stand upright on its own. I was left with no other choice but to cut some feet that I would attach to its backside to keep it upright. Using my digital angle gauge I traced out some feet onto an offcut of the olive wood. The angle of the feet are the same angle as the base of the sunglass stand, 15-degrees. After all the cutting ugliness was out of the way I was left with 2 of these feet. They measure 2 inches wide across the bottom and they’re 4.5 inches tall. I countersank and pre-drilled 2 holes on the back of each block to prevent them from splitting when I screwed them to the stand. I used a soft clamp to clamp the feet to the backside of the stand and then screwed them in place. Fun fact, I used a 1 1/2″ #8 screw at the top of the block and a 2 1/2″ #8 screw at the bottom because of difference in their thickness depending on where I was screwing through. Is that a fun fact? Not really. But it may be helpful for anyone hoping to recreate this project. With the feet installed I was ready to move onto mounting everything to the surface of the stand. So you remember those bungee cords that were holding the sunglasses? Well, I needed a way to mount them. I figured the best way would be to drill some holes, pull them through and then tie knots at either end. The first step in that process, before I even drilled the hole was to layout my hole locations. I traced out two parallel lines (hmm I’m doing that a lot this project…) and then measured the hole locations up from the bottom of the stand. I then basically did the whole thing over again for the knob locations. Except I didn’t need to draw a parallel line. What a time saver! Enough planning, time for action! I grabbed my cordless drill and got to poking some holes in this olive wood. The trick to drilling holes for drawer pulls and knobs is to pick a drill bit that’s slightly larger than the mounting screw. As you’re drilling be careful not to apply too much downward pressure on the drill. If you do, you run the risk of bursting the drill bit through the backside of the wood and leaving a nasty crater. Enough planning, time for action! I grabbed my cordless drill and got to poking some holes in this olive wood. The trick to drilling holes for drawer pulls and knobs is to pick a drill bit that’s slightly larger than the mounting screw. As you’re drilling be careful not to apply too much downward pressure on the drill. If you do, you run the risk of bursting the drill bit through the backside of the wood and leaving a nasty crater. After I glued it I used a set of soft clamps to hold the cracks shut while the glue dried. You’d be surprised how fast some wood glues dry. The glue I was using dried in 20 minutes according to its bottle. Part of the reason I picked olive wood for this project is that it has wild textures and cool grain patterns. Unfortunately, that also meant it came with a lot of pitting and knots. Not to worry though, I grabbed some walnut coloured wood filler and smushed it into any and all of the open crevices. Looking pretty good if I do say so myself! But who got all these pencil marks and wood filler smears all over my beautiful slab of olive wood? The nerve of some people. To remove all of the aforementioned blemishes and to smooth the surface of my stand I brought the random orbital sander out of retirement. I started with 80 grit sandpaper and worked my way up to 180 grit sand paper. Normally I like to sand my projects to at least 220, but the clear coat I was using recommend that all surface be sanded to 180 grit. I’m guessing this helps with adhesion. Ok sorry for the quality of this photo, but it was hard to get a photo of me tying a knot. I just did a simple double knot on one end of the bungee, threaded it through the holes and then tied a second double knot on the other side and cut off the excess. This is what it looked like on the back side. Because the bungee cords are under quite a bit of tension this simple knot should do quite nicely. The next step was to add the knobs. I threaded the mounting screws through the stand from the back side and then screwed the knobs onto them. Again these knobs aren’t the ones I ended up using in the end, but the process for attaching them is the same. I countersank the backside of stand primarily because the screws provided with the drawer pull weren’t quite long enough to thread through the stand, which is almost 1″ thick. It’s also kind of nice to have the screw heads recessed into the stand though, makes for a slightly cleaner look from behind (like that really matters haha). I thought about trying to sand out this light surface pitting in the olive wood, but I decided against it in the end. I really like some of the natural textures in the olive wood so why not leave them? It helps give the whole stand the feeling of real wood. My girlfriend definitely has a soft spot for gold. Replacing the silver knobs with these gold drawer pulls definitely matches her aesthetic much better. Any extra slack on necklaces can simply be tossed over the backside of the stand. Alright! That’s it for this one. Hope you enjoyed it. If you liked what you saw here, please check out my Instagram and join my Facebook group. If you have any questions or comments hit me up below!